Over the last year or so the amount of PC titles being released have slowly dwindled due to the success of consoles and the amount of piracy currently in the PC market. The PC market suffers badly from piracy with it commonly noted that most games are available to download on or a few days after release, thus losing the developers vast amounts of money. However the quality of some recent games in the PC market shows the true problem further with developers only seeming to port games across rather than program them specifically for the hardware. I am part of a gaming community where most members are 25+ and we generally discuss the poor quality of releases in the market. Take the recent Operation Flashpoint games, these seem to be developed for the consoles and as an after thought ported over to the PC, long gone have the days come when the next big release was a PC exclusive. The benefits of creating games for the PC are that the hardware far out ways the capabilities of current consoles, allowing developers to put alot more detail into each game. 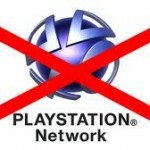 But because of the piracy aspects alot seem to shy away from PC, and to be honest who can blame them. So what is the way forward, well to me in one area MMORPG’s (Massively Multiplayer Online Role Playing Game) they are realising that developing and giving the game away for free with micro transactions (ie buying extras – mounts / experience enhancements etc) bringing them in revenue on a constant stream. I would personally, if the game was good enough, pay a small fee for the game and add to it with these transactions, but this cant be done in other genres. Unless developers can come up with a way of combating piracy I can only see the market for PC games getting smaller. Your thoughts on this area would be appreciated – do you agree with the comments or have ones of your own? With all things there are some essential things you should do with websites in case of the dreaded hosting crash, loss of data or corruption. These mainly apply to self-hosting setups but its a good practice to get into. This is the most essential thing you should get into the habit of doing at least once a week, especially if you post regularly on your blog. The database is where all the settings details and post contents are stored so if this becomes corrupter or damaged you may loose a lot of your posts. If you self host you this is something that can be achieved through your web hosting control panel normally. Alternatively you you can install a plugin that allows you to download the database directly – the one I have used is located here. This whilst not as important as the database backup is still something I would recommend doing at least once a month if feasible. You will have spent some time collecting photos and images and resizing them as well as all the plugins and widgets and to lose them could mean a lot of hard work to get your blog back to its current state. The only way you can really do this properly is by accessing the site via the control panel and using the options there or the quicker method if you are a little bit ‘techie’ is to use an FTP program and download all the files from the server. Depending on the size of the blog / site it may take a few minutes to do. 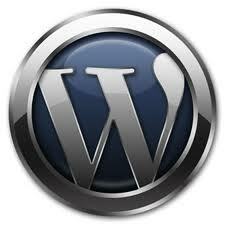 Just remember when you do this you are also downloading all the WordPress platform files as well. On free versions of popular blogs the host tends to make numerous backups of the database and content of each site so having to do this isn’t necessary. A few weeks ago I created a post (link here) that introduced some useful WordPress plug-ins to include on your self hosted blog. This is the second part of the post highlighting a few more plug-ins that people should integrate if possible. WP-Youtube Lyte. If you are looking to include YouTube videos in your blog posts then this plug-in is simple and easy to use. There are a few basic settings to change that include video size and functions but makes playability and embedding of videos simple and straightforward. WordPress.org link here. NextGen Gallery. Do you need to include a stylish looking gallery on your blog, then NextGen gallery is a must. Full of features to allow you to style your pictures in various formats and layouts makes this a certain winner in the field. I have this gallery installed on Best Bits and Bobs but have yet to have the need to use it to its full potential. 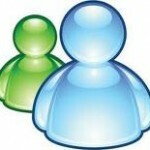 Once installed its fairly simple to use in uploading pictures , creating galleries and albums. For full details and all the listed features are available here. 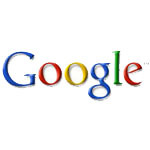 Google XML Sitemap. This plug-in is useful for generating a site-map XML file that will help search engines like Google, Bing, and Yahoo etc index your blog. With a site-map it is easier for the search engine bot (crawlers) to see the complete layout and content of your site and include them in their search results and helps retrieve the pages easier. This plug-in also informs the search engines when new content or additions have been entered on your site making them keep up to date with your content. For full details see the authors page link here. The plug-ins I have included here may not suit everyone’s requirements but are ones I have used and find simple and easy to install and have achieved the results I was looking for, there may be better alternatives that suit others and if so please get in touch and I will include them in later revisions of these posts. In a previous post, located here I outlined some of the most useful shortcut keys for Intemet Explorer 9. I thought it would be good to replicate this type of post and outline some of the most widely used shortcuts for Windows. There are a great number of shortcuts other than the ones that I have listed but these are ones I feel may be used by the majority of people. CTRL and A – Selects all items from the current active window. 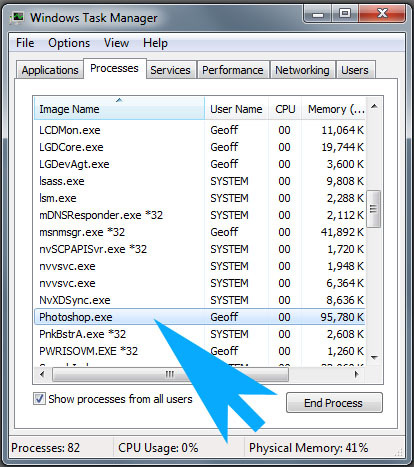 WINDOWS KEY and F – Search for a file or folder. Hopefully at least a few of these will be helpful to a few people and speed up the use of Windows for some tasks. In today’s world we are all looking to do things quicker and get frustrated when items take an eternity to do certain tasks. I have decided to write a couple of hints and tips that could speed up the use of your PC. Firstly for all those of you who have dual or quad core processors did you know that you can stop individual processes from using all of the cores and hog CPU performance. Its a little know fact that you can get some processes to run on a single core leaving the others free to utilise the remainder. This is best suited for when you are running items like anti virus scans, firstly you need to know the process name, most are self explanatory. 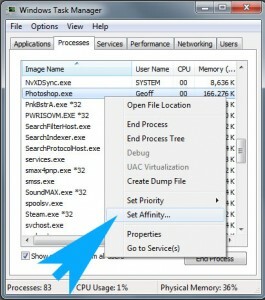 Hold down CTRL, ALT and DELETE and you will either be shown the task manager or the screen to select it. 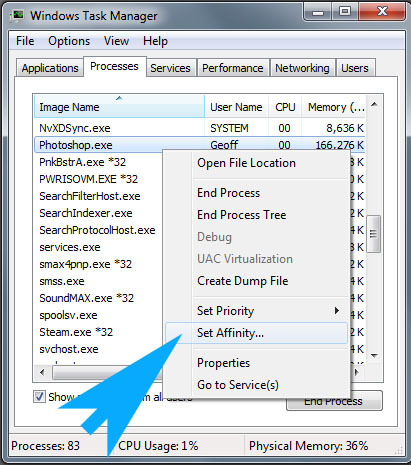 Once selected it will show you the normal task manager window, you need to select the processes tab from the top. 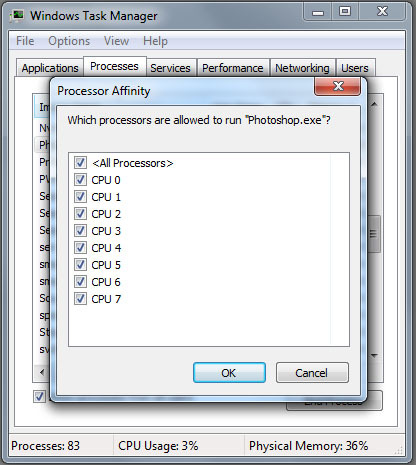 When you have found the process you are looking to set the CPU affinity to, I am using Photoshop for the process of this article, you need to select the process then right click. You will now be shown the menu where you can see various options relating to the individual process, the menu heading we are looking for is Set Affinity. In the following menu it will show you the amount of CPU cores you have on your PC. When dual cores and quad cores originally came out some programs wouldnt run on multi core systems and you had to set the CPU affinity each time. Generally it doesnt matter what CPU core you use but if a program becomes unstable try setting it to zero first. Windows 7 and Vista comes with an option to use gadgets and sidebars and whilst on powerful machines they are very appealing to use on systems where you are on limited resources (i.e. System memory) it is better to remove them to increase performance. 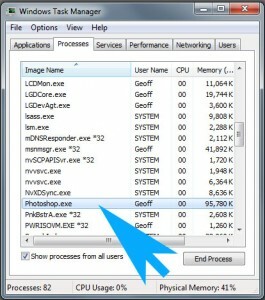 To remove these is simple, in Windows 7 right click your desktop and from the menu move your cursor over View. From the sub menu near the bottom there is an option to View desktop gadgets, if this has a tick next to it click it to remove. In Windows Vista to remove the sidebar right click a blank area around a sidebar gadget and select Properties. There will be a check box which says “Load Sidebar when Windows starts”. Make sure the tick is removed and next time Windows starts the sidebar wont run. As an avid gamer in my spare time, although lately I don’t seem to have that much of it, I came across a few free games worth trying. 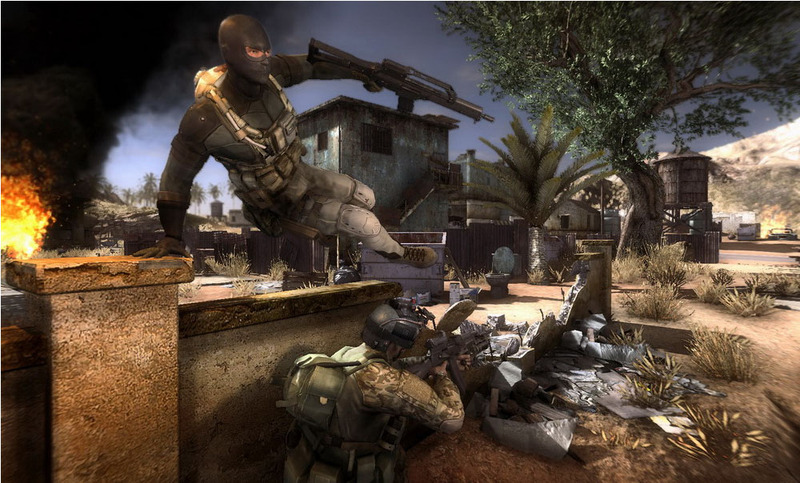 The first is a game I came across on Steam called War Inc.
War Inc is an online shooter game in the genre similar to classics like Counter Strike and BF2BC but obviously not as polished and complete as these. But don’t let this distract you, the game is set up in Conquest or Deathmatch modes and as you fight your way through the levels you gain experience points which as you progress they unlock new weapons, addons and clothing etc. The game plays reasonably well and I have only seen a small bug when trying to alter the graphics settings. I played it for the first time last night with a few people I know and thought it wasn’t bad at its current state. The developers are continually improving the game with new maps, code tweaks and looking into a community aspect which I presume will be along the lines of a friends addition where it will make it easier to join in the same games alot easier than what it is. If you want to jump ahead you can use micro transactions to purchase kit from the store, but that is down to personal preference. Overall the game with a few friends is enjoyable and can only improve over time but in my opinion well worth a go for someone who like this genre of game. 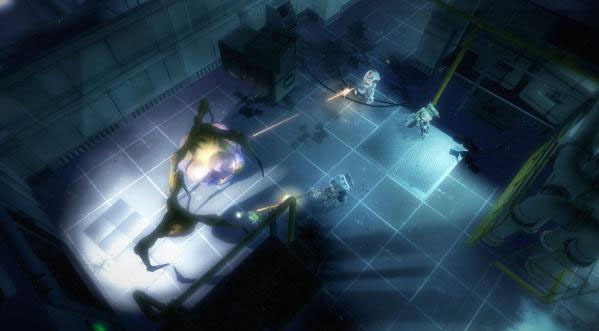 The second game which has been out a bit longer and which also is of the shooter genre is Alien Swarm. Alien Swarm is a game set in a top down type perspective and uses mouse to fire and aim with the keyboard used for the player movement. The idea is to work through the levels completing the objectives as you go. This is a simple game that can be played in single player or better in Co-op or multiplayer. As with War Inc as you progress higher up the level you also unlock new weapons and with steam achievements. Whilst these games are nothing near the major releases we see on the High Street they are definitely worth a go. As they are free what have you to lose. According to the website The Register Microsoft are adding a few new features to their Hotmail systems. The first is an early warning system for users to report suspicions that a colleagues, friends or families account has been ‘hacked’. Hotmails systems then check the account using a ‘compromise detection engine’ which will determine if the account has indeed been hijacked. If this is found to be true Hotmail will suspend the account making it useless for the ‘hacker / spammer’. 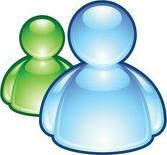 The original user is then asked to retrieve their account through an account retrieval process. According to the site Microsoft has been testing this feature for a few weeks and has highlighted a vast number of accounts that have been hijacked. This feature by Microsoft is an absolute must as the amount of accounts I have seen used for ‘spamming’ is alarming, thumbs up to Microsoft and Hotmail for this one. Hotmail is also now not allowing the use of weak passwords when signing up for a new account. These are things like 123456, abcdef or ‘password’. This will will only be applied to new accounts for the beginning but should prevent a huge amount of accounts being hijacked. In my opinion both these new features are a great step in the right direction in cutting down the amount of spam and hijacked accounts that are occurring over the Internet at the present time. Microsoft also note that they will inform other web-mail providers of any accounts it finds are problematic and not under their remit. 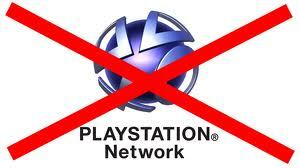 What infuriates me in online gaming. Having been an avid PC gamer and to a lesser extent console gaming there are a few things that really annoy me when playing against other people. 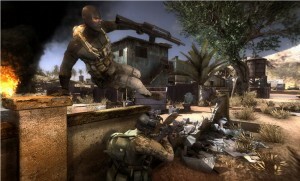 In all games you will come across the cheats, people who use exploits in games, or install game hacks. This to me is just now more of an inconvenience rather than an annoyance as I know at some point they will be be caught and what usually happens is their game account will be barred or restricted. However there are a couple of things that really do annoy me greatly. The main thing to me that ruins some online game experiences is your opponent losing and just before the game finishes they disconnect – leaving you with no reward for beating them. This happens alot in FIFA (on all game versions) and the winner gets no points bonus for beating someone. FIFA is a game I enjoy playing, and thought I would have a few online games last night. I played one particular person and was winning 4-0 at half time, they continued into the second half where I scored another and they then proceeded to disconnect with me getting the message saying the connection has been lost. What a waste of time these games are, developers need to encode something into things like this that penalises anyone that quits a game – even if it is something along the lines of their ISP having a blip. Why should genuine players have to deal with people who know how to beat a flaw in the game??? If you go onto most online FPS servers now you will probably hear at least once someone being accused of cheating. Long gone are the days when people realised that some people are actually better skilled at games! Anyway what annoys you about online gaming?